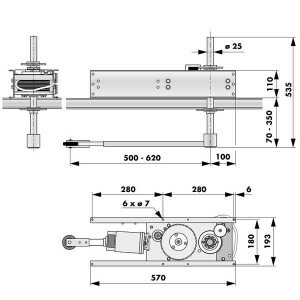 The DICTAMAT 304 AZ is an electrical door operator which opens hinged landing doors up to 200 kg. The special feature of this operator is that only one DICTAMAT 304 AZ – mounted on top of the car – is sufficient to open all landing doors of the lift (condition is that they are located in the same position and open in the same direction). The arm of the DICTAMAT 304 AZ is not connected to the landing door. It just pushes the door open with a roller on the end of the lever. The door is closed by an already installed closing spring or a door closer. The door operator is equipped with an electronic position control system. The final positions are memorized in the control system – even in the event of a power failure. The door operator slows down before reaching the final positions. This feature increases the safety and avoids noise and unnecessary strain on the doors. Along with the speed and the final positions, a response level for a reversing function can also be precisely adjusted in the control system. 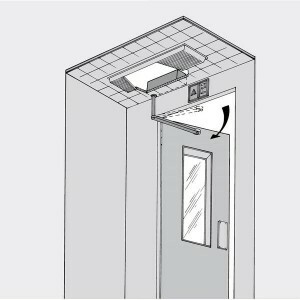 If the door hits an obstacle whilst opening, it reverses immediately and returns to the starting position. 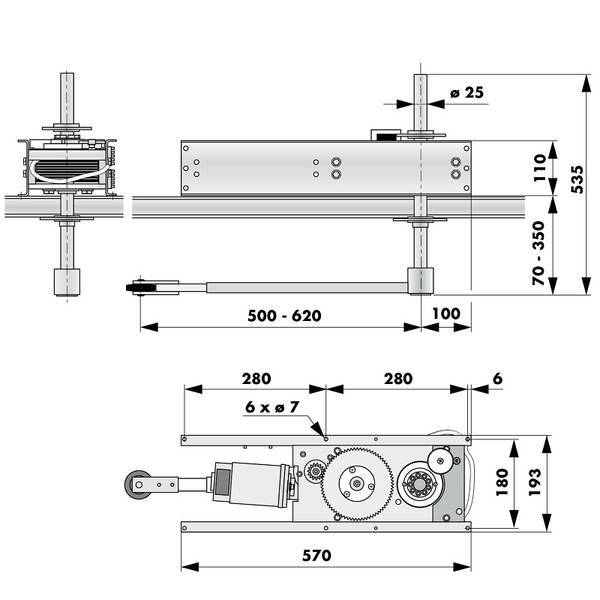 The length of the axle can be adjusted between 70 and 350 mm. Usually the door operator is mounted on the cabin roof. Please observe any relevant safety regulations, especially the distance of the lever to the lintel to prevent injuries. The door operator is ready to mount once delivered, with connector for the plug-in cable connecting the SQUARE 820 AZ control system to the motor. The adjustments are entered with an Open and Close key each on the casing of the control system. The length of the axle is adjustable, so that it can exactly be adapted to the requirements of each cabin. The maximum distance between the bottom edge of the door operator on the cabin ceiling and the operating arm opening the door is 350 mm. The door operator can be used both for right and left-hand doors. 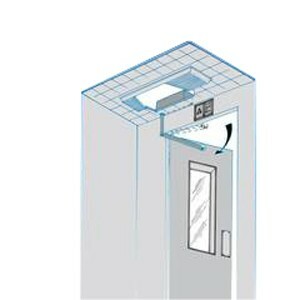 The DICTAMAT 304 AZ operating arm is not connected to the landing door of the lift but is provided with a plastic roller which runs on the door pushing it open. Therefore, the door can easily be opened by hand. When the operating arm has reached the open position (memorized in the control system), it returns to the closed position as soon as the set time for the automatic closing has expired. For closing normally is adjusted a higher speed than for opening. As soon as the operating arm has reached the closed position, a micro switch placed on the axle of the door operator connects with the central lift control system. This assures that the lift only starts moving again when the operating arm is securely back inside the cabin. The door itself is closed by a door closer or closing spring. 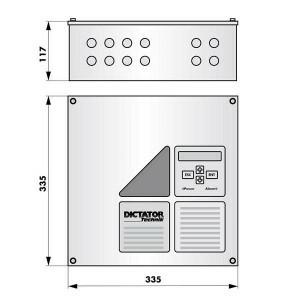 The control system designed for the use with the DICTAMAT 304 AZ is the SQUARE 820 AZ. The final positions are adjusted in the control system. Apart from the positions OPEN and CLOSED the positions for changing to the crawling speed before the positions Open and Closed have to be adjusted. Starting at these positions the speed of the door operator is reduced and the door enters slowly the final position Open respectively the operating arm returns slowly to the final position Closed. Impulse OPEN: The door opens completely after pressing the switch shortly. Impulse CLOSE: The operating arm of the door operator returns to the closed position after pressing the switch shortly or after the adjusted time has expired. The door itself is closed by its closing spring or a door closer. Automatic closing: After reaching the open position the door closes automatically after a time pre-set in the control system (max. 999 sec.). If necessary, connection of safety equipment. Response level for reverse function as additional safety device. Contact switch for e.g. the connection of a signaller. Diverse parameters for the running characteristics of the motor for an optimum adaption to the respective lift door.